With Celestial Decay", Atritas from Basel present their third full-length album in that days, certainly their strongest, most mature and most individual opus so far. The symphonic elements are now appearing more subtly than ever, the speed has increased, the songs are more venomous, more direct, sometimes massive and brutal, then again hypnotic and psychotic, and the downsizing of the line-up - there's no fix keyboarder part of the band anymore and the drummer has been replaced - has given the band obviously freshness enthusiasm and vitality. It's not only the possessed vocals or the ambitious guitar shredding that makes the development apparent, but also and most of all the compositions' depth and compactness, the hymns include the fastest blastings at one side and the most majestic, mightiest and intensive passages in the history of Atritas on the other side. While some songs show a lot of Thrash-Metal-elements, others are dominated by pure Black Metal-speed. Atritas have changed their musical face, but fans will still recognize the core of the Swiss horde. Founded in 1997 by Gier (vocals) and Ork (drums), the band has been a part of extreme Metal for over a decade. On the first demos, the musical tenor used to be melodic-symphonic Black Metal in its classic way, while the third demo "Dunkler Reigen" was the most chaotic record of the Swiss. On the fourth demo "In Regressu Diaboli", one could discover a slight modification in sound, which became more and more manifest on the albums "Where Witches Burnt" and "Medium Antogpd". "Celestial Decay" now, the first album with the new and definitive Atritas-line-up, which deals - to summarize - with the loss of religious dependence of the human being and the turn to another, individual divinity through awareness, is the climax for the present considering the creative producing of the band. Celestial Decay" was produced once again at the Iguana Studios in Freiburg by Christoph Brandes (Unlight, Bitterness, Finsterforst, Necrophagist), and the final cut, the mastering, was done by Victor Bullok (Dark Fortress) at Woodshed Studio Germany. 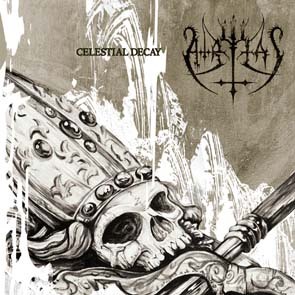 With „Celestial Decay“, Atritas from Basel present their third full-length album in that days, certainly their strongest, most mature and most individual opus so far. The symphonic elements are now appearing more subtly than ever, the speed has increased, the songs are more venomous, more direct, sometimes massive and brutal, then again hypnotic and psychotic, and the downsizing of the line-up – there’s no fix keyboarder part of the band anymore and the drummer has been replaced – has given the band obviously freshness enthusiasm and vitality. It’s not only the possessed vocals or the ambitious guitar shredding that makes the development apparent, but also and most of all the compositions’ depth and compactness, the hymns include the fastest blastings at one side and the most majestic, mightiest and intensive passages in the history of Atritas on the other side. While some songs show a lot of Thrash-Metal-elements, others are dominated by pure Black Metal-speed. Atritas have changed their musical face, but fans will still recognize the core of the Swiss horde. Founded in 1997 by Gier (vocals) and Ork (drums), the band has been a part of extreme Metal for over a decade. On the first demos, the musical tenor used to be melodic-symphonic Black Metal in its classic way, while the third demo “Dunkler Reigen” was the most chaotic record of the Swiss. On the fourth demo “In Regressu Diaboli”, one could discover a slight modification in sound, which became more and more manifest on the albums “Where Witches Burnt” and “Medium Antogpd”. “Celestial Decay” now, the first album with the new and definitive Atritas-line-up, which deals – to summarize - with the loss of religious dependence of the human being and the turn to another, individual divinity through awareness, is the climax for the present considering the creative producing of the band. „Celestial Decay“ was produced once again at the Iguana Studios in Freiburg by Christoph Brandes (Unlight, Bitterness, Finsterforst, Necrophagist), and the final cut, the mastering, was done by Victor Bullok (Dark Fortress) at Woodshed Studio Germany.